Is your fabrication shop challenged with forming higher strength steels, more complex parts and shorter turnarounds or the need to form smaller lots of different part types? Seyi's Single-point Straightside Direct Drive Servo press, engineered for limitless programmability for stroke, speed and dwell times, gives you the versatility you need. 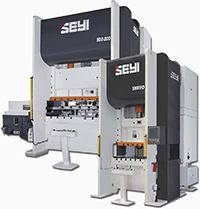 The Seyi servo press features a high-torque low-RPM servo motor, high-strength construction, 1-connection small bed size, eight preprogrammed profiles along with freeform motion and electronic overload protection.